Members of Peaceful Uprising and Utah Tar Sands Resistance rallied outside the Bureau of Land Management (BLM) in Salt Lake City on Monday, as part of a week of solidarity actions with the Tar Sands Blockade in East Texas. Several of us visited the blockade in October for a mass action, and because we’re working to stop tar sands mining from happening in Utah, the importance of working together and showing solidarity has become ever more clear. Just one week earlier, the BLM said that it would likely release nearly 830,000 acres of federally-managed public lands in Utah, Colorado and Wyoming for tar sands and oil shale mining. In its final environmental impact statement (EIS) on the proposed mining, the BLM claimed it had scaled back its original proposal of leasing up to nearly 2.5 million acres of public lands, but our groups knew this was pure spin. Therefore, we brought a People’s Environmental Impact Statement to the BLM, explaining exactly why tar sands and oil shale mining are far too dangerous to ever be allowed in the U.S. Standing outside the BLM’s offices, we read our statement, then staged some theatrics featuring lawyers representing the people verses the BLM, as well as a tar sands monster — a creature who never wanted to be extracted from the earth, and is on a mission to stop tar sands and oil shale mining from happening in the U.S. The crowd of about 60 people then attempted to enter the BLM offices, only to meet an armed front of security guards. Two members of our groups were eventually allowed to pass and deliver the People’s EIS. In our statement, we pointed to four major impacts of tar sands and oil shale mining: water pollution, dropping water levels, loss of livelihoods and climate change. Not only would the mining consume massive amounts of water in an arid region, it would also poison waters with dangerous compounds that are toxic in parts per trillion. In response to companies’ claims that the mining would create jobs, we explained, “For any jobs that tar sands mining allegedly would create, countless local jobs would be destroyed.” Towns across Utah gain much of their income from tourism, either directly or indirectly, and destroying and degrading wilderness would impact everyone who lives within tourism-based economies. In Utah, tar sands mining could begin as early as next year if the Canadian company U.S. Oil Sands is able to fund and construct the infrastructure for the project. Right now, the company has leases on 32,000 acres of state land andoperates a test pit in the East Tavaputs Plateau of eastern Utah at a site called PR Spring. Given this reality, we have much work to do in the coming year to stop destructive mining practices from not only continuing, but growing. At least 40 other communities, many facing their own struggles with these extractive industries, participated in the week of solidarity actions. Rallies and banner drops took place from British Columbia to New York to London, by groups such as the Unis’tot’en clan of the Wet’suwet’en First Nation, Cascadia Forest Defenders, Glacier’s Edge Earth First!, UK Tar Sands Network and 350.org — which convened 3,500 people outside the White House to call on President Obama to reject the Keystone XL pipeline. 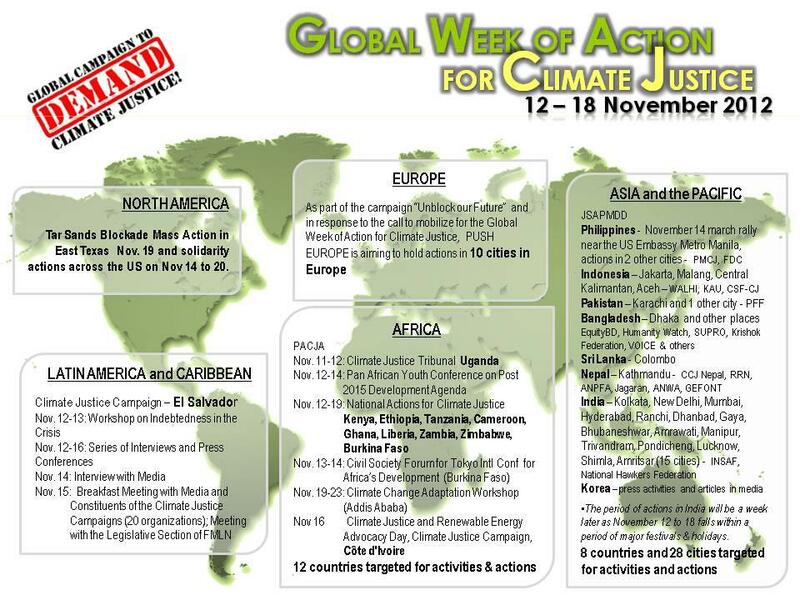 Click to view the Global Week of Action for Climate Justice map. These actions were also part of an even broader network of solidarity actions called the Global Week of Action for Climate Justice. Hundreds marched to the U.S. embassy in Manilla last Wednesday to demand immediate climate action, while large numbers of peasants, organized by the Pakistan Fisherfolk Forum, demanded the protection of natural resources in Jamshoro. The Rwandan Climate Change Network helped spread climate awareness to Rwanda’s rural populations. Meanwhile, in Texas, over 100 people stopped construction of the Keystone XL pipeline on Monday, with four locking down and others setting up a new tree-sit blockade. Eleven blockaders were arrested, some of whom were brutalized by police. Houston blockaders led 80 community members on a tour of the refineries and petrochemical plants in the city’s east end. Kim Huynh of the Tar Sands Blockade says the solidarity actions represent not just a week of support, but a powerful network of allies working on a common cause.